By author: Kenneth F. Kitchell Jr. 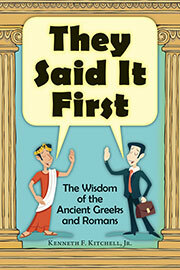 They Said It First provides a unique twist on quotation collections: ancient Greek and Roman sayings, alongside English translations, are paired with their more modern counterparts. The likes of W. E. B. Dubois and Mark Twain may have eloquently expressed eternal truths and pithy witticisms—but frequently, Homer or Seneca the Younger got there first. This text works well as both a reference and an entertaining read, offering up a diverse array of sources—ranging from eighth-century BCE epic poetry to twenty-first-century song lyrics—with select commentary. Quotes are arranged thematically, so finding the perfect saying to suit any occasion is simple and straightforward. Precise citation locations for each quote ensure that curious readers are able to directly consult the source material.